In the northern hemisphere, when Fall or Autumn comes in late October and into November, the days get noticeably shorter and it gets dark earlier and earlier in the afternoon. The further up north one gets, the more noticeable this becomes. The darkness of the longer nights often brings about a melancholy that some say is a sign of Seasonal Affective Disorder or SAD. I can see how November seems to be environmentally and consciously suited to liturgically observe how our lives also have an ebb. After all, this is when the Church deems fit to place the Solemnity of All Saints and the commemoration of All Souls’ Day as well. Our shared mortality isn’t something that we readily like to be reminded of. In fact, most of the things that we dedicate our lives to, and the things that we like to celebrate encourage us to think that life would be better if it doesn’t end. Rightly so, because we are wired for life, and we push thoughts of our mortality away from our consciousness in so many ways. Many of us think that our happiness would be terribly curtailed and truncated if our lives were to come to an end. However, those of us who have been graced with the gift of faith and have as our core belief that this life is a mere stepping stone - to a life that is far more dynamic and spirited. We are reminded, and necessarily so, that there are many variations of ersatz and temporary happiness of this life, but our faith is what gives us hope even in the face of death. That Jesus Christ became our doorway to that hidden reality through his passion, death and resurrection permits us to even celebrate death despite its pain and bitterness. The Church helps us to do this with dignity and in a liturgical progression with the observances of All Saints and All Souls. Who are saints? These are the trailblazers of our faith – heroic men and women who lived their faith to the full and were unafraid of how difficult it was for them to do so. Saints are people who have accomplished life’s most important task – to be found at the end of their earthly lives fully meriting heaven in its full glory. Some of the faithful may have a slight problem with the way the Church heavily uses the word ‘merit’ in many of its liturgical prayers. Understood in the wrong sense, it does give the impression that one can ‘earn’ what one finally beholds at the end of life’s journey. But it is only when we take this to mean ‘attained the ability to taste fully of heaven’s fruit’ can this be taken to mean the grace that makes this at all possible. We must never have the faintest notion that we can ‘earn’ our way to heaven. Ours is the theology of the primacy of grace. Saints are not only thus tasting of the fruit, but also feasting copiously on its sweetness and delight because they have not taken of it in any self-entitled way, unlike our first parents. We need to remember this for our own sainthood to happen. 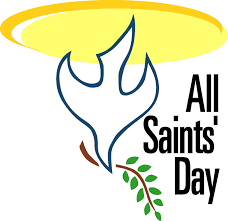 Perhaps not in the St. (insert name here) way, but without a shadow of doubt, all who are in that heavenly feast are the saints whose lives we celebrate each November 1 – whether canonized or not. Our rich heritage in the belief of the Communion of Saints tell us that we are never alone in this sometimes arduous journey to be able to see God ‘face to face’. In the mired contours of our life-journeys, we can sometimes find ourselves in very challenging and trying times. Our faith can even waver and wane because of the strains that are placed on our belief in an unconditionally loving God. It is at these times that I am grateful the Church has given me myriad examples of real life fellow believers, my brothers and sisters in Christ, who stood tall in their own struggles and challenges. Their lives are testimonies that it is indeed possible to not ‘lose the plot’ of our faith. Their stories give me the courage to resist temptation, to love in Christ-like ways, and to continue to pray despite spiritual fatigue and sloth. The saints’ tenacity to love and place God foremost in their lives fortifies my sometimes dwindling and feeble faith. One would think it strange that on the very next day, 2 November, we as Church observe in a solemn way the remembrance of All Souls. The fundamental belief that we celebrate on that day is that the mercy of God is so rich that it allows for a place/moment/time of purification between the ending of this life and the full embracing of heaven’s richness. Essentially, this is what Purgatory is. The Church is saying that ultimately, everybody is important to God, and many, if not most of our lives are lived with mixed intentions that come as a result of our tortured complexity. There are healthy and unhealthy ways of appreciating Purgatory. An unhealthy notion sees that God sends people away from him when they are not ready for heaven’s eternal embrace. But a healthy understanding of this helps us to see that because our vision of our own lives is far richer after it is ended than when we are living in this world, that it is after we die in our human bodies that we see with deep honesty and true humility that we are not ready yet for God and that banquet of eternal life. This state of ‘unreadiness’ is the distance that we put between God and ourselves, and this tension is what creates the ‘suffering’ of Purgatory – a ‘suffering’ that purifies the soul and burns away intentions and loves that are impure. All the while God is still loving and looking intently at that firing of the soul, and awaiting with great delight for his union with his beloved children while we are purified ‘like a refiner’s fire’. Some of these who are getting ‘refined’ could well be our departed loved ones and people who we may not even know, but who stand to benefit greatly from our prayers and corporal and spiritual works of mercy. To be sure, there are many different theologies that support and try to make sense of the Church’s teaching of saints and those who have ‘gone before us’. But these also provide a good reason for us to believe that death never severs a connection. Death may remove one’s physical presence from our lives, but our faith remains something that still connects us. It gives us reason – very rich reasons, to not lose the plot ourselves as our task of living rightly continues. In a video clip, recently, –I heard the speaker saying, “if your God is the God of Mercy,........... if He is the one who sings the Eternal Love Song...............” and I was filled with a certain gladness of heart for I believe I do know this songster - and now, I recognize Him again in your description above. I read in a book on folk lore that the Divine Creator kissed and caressed and sang to every soul He created long before its birth as an infant on earth. This memory of being gently touched by loving hands remains embedded deep within each one of us. It is in one’s pensive mood or in solitude that one can hear again the silent whispering of the song or could it be God’s heart-beat? Perhaps this explains the restlessness of the soul throughout its sojourn, here on earth. When November ushered in the Feasts of Communion of Saints and the remembrance of Holy Souls – I was reminded anew with a quiet joy and gratitude - how fortunate we are to have such a God, whose love is eternal, who never wants to give up on us – however deplorable the state of our soul is and that explains in my simplistic mind – his gift of Purgatory! In my early days after baptism, I looked upon All Souls Day with much dread and sorrow. I would have thought it laughable to be joyful or grateful for Purgatory. Now, however, it is a comforting thought that even to the very end – God is still in charge.